The Palace – the iconic gay bar known for its drag performances – is planning an Ocean Drive comeback. The popular gathering spot for Miami Beach’s LGBT community has been closed since July 4th after losing its lease at 1200 Ocean Drive where it had been for nearly 30 years. The building, which was recently purchased, will undergo renovations. 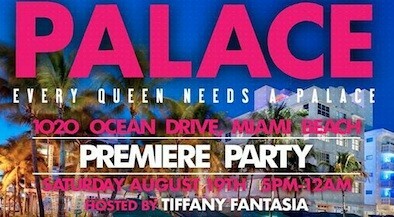 In the meantime, the Palace will “host a temporary tea-dance party to bring the magic back to Ocean Drive for the time being” Saturday, August 19th at the Clevelander.